A huge cloud travels through Klingon and Federation space. Who or what that cloud is, is unclear, but nothing seems to be able to stop it. What is certain, is its course: It's directly heading for Earth. Admiral Kirk takes once again the command over the Enterprise, which has just been refit for 18 monts. Because another thing is certain: The Enterprise is the only ship that can reach the cloud before it comes to Earth. "The only ship available" is a running gag which goes through all shows and movies. But when the Enterprise is in the orbit of Earth it becomes a bit implausible. That aside I think the refitting of the Enterprise worked very well, it's a very elegant ship. And one thing is a given: this movie dwells in its pictures, in great panoramic views of the Enterprise, the universe and V'Ger. I also liked that not everything was sunshine and sparkles. I liked it when McCoy told Kirk off for being arrogant and that Kirk wasn't infallable. BTW: Have you ever registered the fact that the two movies where the final solution was not a gun fight were both TOS movies? 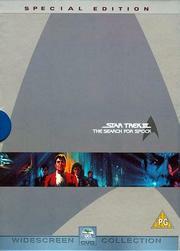 I will be watching this thread with interest since I never seen any of the early Star Trek movies. lol... just never had the opportunity to see them. I do plan on getting them all in my collection eventually. 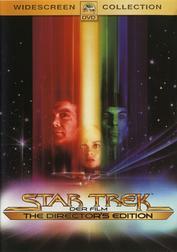 I think the first Star Trek movie I have seen was Part IV. I have the first three in my Wish List, although, if any, I might just buy Part I & II; or would I have to get III too, to complete the "opening trilogy"...? While III is an odd movie (odd in opposition to even), I think it's important because II - IV are somewhat a trilogy and III is also important for the understanding of VI. I can understand if someone has never seen any Star Trek movie. But that there are people who are generally interested in Star Trek but have never seen "The Wrath of Khan"
and III is also important for the understanding of VI. In what way? I think I'll have to watch the movie again some time because I do not remember an important connection between III and VI. Or did you mean III and IV? Well, I own the three seasons of TOS. 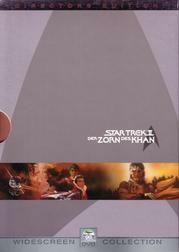 Seems like I need to reserve a spot in one of my upcoming orders this year for Star Trek: The Wrath of Khan. Seeing that (I didn't exactly remember before) even numbered films are generally to be avoided, I might just order I & II (I'd feel weird ordering II without owning I). No, the odd numbered films are to be avoided. The even numbered are generally the better ones (Star Trek 10 is the exception to this rule). Star Trek 2,4,6,8 are all very good movies. The others range from average to bad. The Enterprise has become a training ship under the command of Spock. And Kirk can't handle the fact that he getting old. But suddenly Kirk gets an emergency call from an old girlfriend because someone's out there who wants to even the score. Khan is the best advisary a Starfleet captain could wish for. Only General Chang can level with him and both happen to have an interest in english literature. As to Spock: As much as I hate it when they kill good characters I have the utmost respect for someone who can apply the third principle of sentient life*. In my opinion there is a logic hole in the movie (although only a Trekkie would think of it) when it comes to Genesis: I can't imagine that the Federation would really be willing to let the Genesis experiment go so far. The arguments McCoy used must have come up earlier and they had to see how dangerous such a thing could be. *The third principle of sentient life is the capacity for self-sacrifice, the conscious ability to override evolution and self-preservation for a cause, a friend, a loved one. I mean the fact, that Kirk's son has been murdered by a Klingon and he has a grudge against them. I wouldn't go so far as to avaoid them but the single-digit even ones are indeed the better ones. My personal preference is 6, 4, 8, 2. Sarek - Spock's father - is visiting Kirk because he hopes that Kirk bears Spock's Kattra, his living soul. But it is McCoy who has the "honour". And now Kirk and McCoy have to return to Genesis to get Spock's body and return it to Vulcan. In this movie hardly anything worked. It starts with the ground premise. If such a ritual would exist it sure would be a lot more complex and time consuming than that what we saw in II. It's also unclear why the Genesis effect would cause the transformation of Spock's body into a child just to let it grow old again. "Conveniently" until that age that it was before. I also didn't like the Klingons. It may have worked back then, but since that we've learned so much about their culture that I have the feeling this Klingons were portrayed as primitive savages. And the fist fight in the end: It may have been ok back in the series but it wasn't very convincing in this motion picture. Funny, but that's actually what I remembered. Don't know why I wrote it the other way around... Thanks for the clarification. ...and after Karsten's review I am clear, that I would only buy I and II. Thanks!